SBI PO 2019 Notification– Applications are invited for the post of Probationary Officer in the State Bank of India in the SBI PO Recruitment 2019. All interested candidates can apply online for this recruitment from the Apply Online Link. The last date to apply online for the SBI PO 2019 recruitment is 22nd April 2019. The only mode of application is through the internet (Online). The SBI official website through which you can gauge and know more about the recruitment is www.sbi.co.in. But please note that the PO 2019 Apply Online Link will be prevalent in the IBPS website since the IBPS is conducting this recruitment. 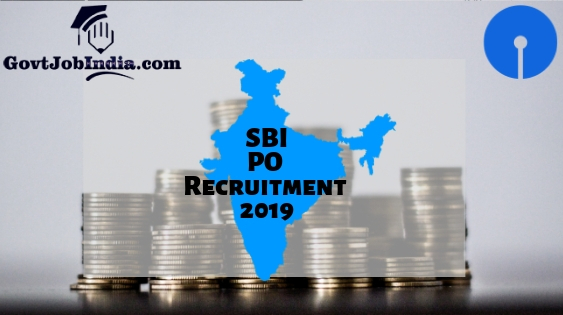 The SBI PO Notification 2019 contains all the details of the job opening, like the SBI PO Salary, Educational Qualifications, Selection Procedure and Application fee. In addition, we have also attached the SBI PO Application Form for candidates to do their registration as soon as possible. We have also made pages for the State Bank Syllabus, Admit Card and Result and you can view all the pages below. The SBI PO Recruitment 2019 is a stellar opportunity for candidates to get a govt job in such a prestigious organization like the State Bank of India. We urge all eligible candidates to apply online as soon as possible in order to register yourself for this recruitment. Now, that you have gone through the contents of this article, let us move onto the detailed description. We have given the detailed information about the SBI Bank PO Recruitment Selection Procedure on our other page which is SBI PO Syllabus and Exam Pattern 2019. Rs. 27,620/- (with 4 advance increments) in the scale of 23700-980/7-30560-1145/2-32850-1310/7-42020 applicable to Junior Management Grade Scale I. Please attach scanned documents according to the given measurement. This includes Photograph, Signature, Left Thumb Impression and a Hand-written Declaration. Requirements for each of the items have been written below. Dimensions- 200 pixels x 230 pixels. Begin this process by registering yourself on the website with a Registration No. & Password. Go to the website given below which will take you to the official portal where the SBI is accepting applications. Now click on the ‘Apply online’ link for the SBI PO Vacancy. Login to the website using registration number & password. Now, carefully fill the application form. Check all the filled details once more and click on ‘Save & Continue’ to save your details. Submit all the required documents according to the prescribed dimensions. Now finally pay your application fee. Submit this and take a printout of the page. Hope you liked this article about the SBI PO 2019 Notification. If you liked this article about this notification, make sure that you share this article with all those who might be looking for this. Furthermore, in case you have any doubts about the SBI Probationary Officer vacancy 2019, comment below and let us know. We will clear it out as soon as possible. So, in conclusion, let us know if you liked our presentation and further subscribe to our website @GovtJobIndia.com. This will enable you to receive the latest updates about recruitment across the country.